Jurassic Garden brought thousands of people together with scientists to discover ancient and modern Australian rain forests at Mt Annan. Photo by Geoff Crane. There were more than 440 high quality science engagement events delivered by New South Wales stakeholders across the state during National Science Week 2016, among 1800 events nationally. Large scale, week-long celebrations were held in the Hunter, the Riverina on the Sapphire Coast and in Sydney, with the second Sydney Science Festival running for ten days and delivering more than 100 events organised by 63 partners. Dozens of local libraries presenting Neural Knitworks, coding, microscopy and chemistry activities and SCINEMA film festivals. Primary and secondary students joined the celebrations with hands on science fairs held in many schools and thousands of armchair enthusiasts participated through the 2016 online National Citizen Science project, Wildlife Spotter. Sydney Science Festival opened with MAASive Lates: Science. This free, adults-only event attracted 2000 people. International Festival guests included: from the United States, biohacker Dr Ellen Jorgensen from Genspace labs in Brooklyn, acclaimed National Geographic cinematographer Bob Poole, space historian Amy Sheira Teitel, MIT physicist Professor Ian H Hutchinson and from the United Kingdom, acclaimed TV presenter Professor Brian Cox. In addition to two full weeks of schools programs that attracted 8,000 students, the Australian Museum’s Super Science Saturday offered hundreds of things to see and do. Science in the Swamp again presented a fun, free, family festival that attracted more than 10,000 people to Centennial Park. 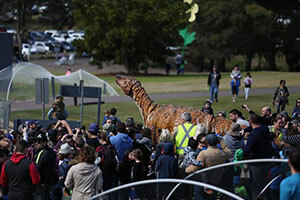 The Australian Botanical Garden at Mt Annan joined the celebrations for the first time with Jurassic Garden, an event in Sydney’s west that brought thousands of people together with scientists to discover ancient and modern Australian rainforests. The celebrated Indigenous Science Experience Family Fun Day @ Redfern was in residence for the fourth year running at Redfern Community Centre and each of Sydney’s universities joined this year’s program with a line-up of expert talks, demonstrations and panel discussions. Three of Sydney’s top medical research institutes were on the program with anxiety body mapping presented by The Black Dog Institute, Genome Gazing presented by the Garvan Institute and a Science Open Day at the Woolcock Institute. Science film screenings and panel discussions were held at the Dendy Newtown and at the Australian Museum and the Australian Film Television and Radio School hosted an expert discussion about what makes a great science documentary. Other high profile partners joining the National Science Week campaign for the first time were the National Institute of Dramatic Art and the inaugural AFR Innovation Summit. Overall, more than 1.3 million people are estimated to have participated in 1800 events nationally. Inspiring Australia thanks all those who have worked to make National Science Week 2016 a huge success and we look forward to our continued partnership with organisations large and small. Jackie Randles in Manager Inspiring Australia (NSW).